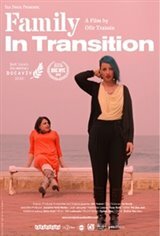 The story of the only family in Nahariya, a small traditional town in Israel, whose lives change completely after their father finally decides to tell his family that he's a transgender woman. Their mother chooses to stay with her spouse through the whole process but just as it seems that life is back to normal, she takes a sharp turn and shakes everything up again. This is a story about a family that does not follow dictates; a family that breaks social conventions; a family that changes what we thought we knew about gender, parity, parenthood and being transgender. But most of all, it is a story about a family that redefines the limits of recognition, acceptance and love of those closest to us.